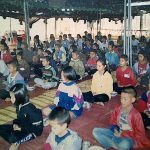 When it comes to hardship, pain and illness, it is something that Khun Mae is well familiar which she faces with equanimity. Many people have sought advise from her and many times, she is able to offer advise that soothe their hearts as she spoke with compassion and understanding having personally gone through challenges and tribulations. Khun Mae seldom talk about her health problems. 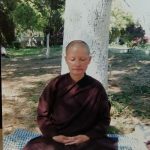 However, I wish to share about her health issues and how she preservered to continue to dedicate her life to the Buddha and to help as many people for as long as she could. Khun Mae’s birthday had just passed and yet the day was spent with appointment with the doctors for her back and throat. She would have another appointment for her eyes on Wednesday to check on her glaucoma. Currently she had a number of health problems. Often she was able to offer advise as she is well familiar with illness and pain. More than 15 years ago, Khun Mae had been diagnosed with uterus cancer. 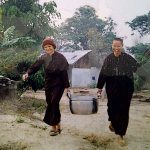 That time she was living a life of real hardship and poverty during the beginning years when the Lampang temple was set up. There were a few nuns living with her that time. She did not inform the nuns but she travelled alone to Bangkok for the operation at a government hospital. Few days after the operation, she was discharged. She went to buy requisites for the temple and took a bus from Bangkok back to Lampang (more than 10 hours journey). She stopped at the main road and walked a distance back in the temple carrying very heavy items. Few days later, she was working on the temple pouring cement when she noticed she had some bleeding. As she took no proper rest, her stitches came out revealing open flesh and she just calmly checked herself into a nearby government hospital. After 6 months after the operation, she had a growth in her wall where her uterus had been. Khun Mae perceived this during her meditation and during her checkup she told the doctor about it. The doctor mentioned it was impossible to have any growth anymore as her uterus has been removed. The doctor then asked her who told her that. Khun Mae mentioned she felt the growth as during meditation her heart settled at the area and became aware of the growth. The doctor still mentioned it was not possible. As Khun Mae was leaving the room, the doctor hesitated and called Khun Mae back… he said ‘ok ok, we would do the examination to put your mind at peace’. During the examination, indeed there was a growth located at the area where her uterus had been and further tests revealed that the growth was in fact cancerous. The doctor during that time had given Khun Mae about 3 months to live. The doctor prescribed a strong medication for Khun Mae but after eating, Khun Mae’s body went into shock. In fact, she slept and woke up at 2pm. She became aware that had she eaten the medication, she may have passed away in her sleep. Knowing the medicine would kill her, she disposed the medication and refused to eat it. During meditation she became aware that she should take traditional Chinese medicine hence she went down to Singapore to consult a Chinese physician. After taking the Chinese medication, a subsequent check few months later revealed that growth had dried up and no longer cancerous. This was more than 10 years ago. Note: Each of our body is suited to a particular way of treatment. For Khun Mae, she was aware that her body was suited to TCM. However it is not necessarily that the treatment would be applicable to all. Then a few years after that, she nearly lost her life after falling from high level while fixing the ceiling of one of the kutis. The fall dislocated her backbone. She was alone that time. After a while, she struggled and managed to place hot water in a glass bottle and use it to massage her back. For quite sometime, she could not kneel or bend properly. From then, she lived with physical pain on a daily basis. Yet, she continue to the never ending weeds growing at her temple in Lampang often till the wee hours of the morning. She commented once that as she completed finishing one area, the weeds had grown back at another area which she had just cut not long ago. In such events, she would hardly sleep doing all the work like preparing the seating and resting areas, clearing the place of weeds, cooking and teaching. Above – she was carrying one of the pots of food that were being cooked for the participants. Her mobility improved when she undergo treatment at a traditional Chinese practitioner in Singapore. Not long later in 2005 I met her for the first time in a monastery in Malaysia when I went there for my own meditation practice. I remember that time, she came with about few others- and I had arrived earlier than them (I learned later that she sat through the bus from Lampang to Bangkok then a train to Malaysia all the way carrying boxes of fruits like mangos to offer to the temple). The moment she arrived (even though the journey had taken her a few days and her back was in pain), she would start to clean up the area of the temple where it was filled with weeds. Others worked with her but stopped shortly but she would be the one working for long time, pulling weeds, sweeping up the dried leaves and clearing the walking meditation path. But it is only at physical level as she never let the pain get into her heart. Once, over a something that I was discussed with her, she shared with me that there was not a day go by that she is not in pain.However, through the years I have known her, I have never seen her complaint about her pain, or having bad mood due to being in pain. About few years ago, her back problem causes severe pain and sometimes numbness on her hands and legs. The doctors had informed that she had to undergo operation to insert L shaped rods to support her backbone. However, she delayed the operation as she was focusing to help her followers through short term ordination events and to meet them. Finally about 2 years ago, she finally underwent the back operation after working for long hours, mostly without sufficient sleep to get everything in order. The surgeons were shocked after they saw how terrible her condition really is. The doctors were puzzled because they mentioned that by right, people with that kind of injury would have been paralyzed and yet Khun Mae could still walk (Khun Mae have taught that using breath to manage the pain). The doctors had informed her that she is not to travel as she cannot sit for long periods of time. However, about 2 months later, there is the Year End Ordination event which had already been arranged prior to her operation. She wanted the participants to undergo tudong method to build their resilience and so she also traveled with them, sitting the van for long period of times. She always places the interest of others above herself. About 2.5 years ago, she developed a growth at her throat in which the doctor had advised that it is better to have it removed. However, there is a high possibility that by removing the growth, she would also lose her voice due to the proximity of the growth to her voice box. As she wants to continue to teach chanting and help others, for now she had opted not to undergo the operation, much to the dismay of her doctor as he said the condition does not look good. To help in her back problem (she could deal with the pain but the numbness made it hard to move) and throat, the doctors had prescribed some strong medication that she is required to take on daily basis. The medication needs to be taken long term. As with taking strong medication, it may bring about damage to internal organs like the liver and kidneys on long term basis. There is no one I know who has the kind of resilience, patience and compassion as she did. Despite all her health conditions and being in pain most of the time, she continues to teach and offer words of advise and comfort to many people who know her. Even though many of us may be located in another country or province, she would speak and give priority to address the issues or questions we have. No one would have suspected that she is in fact facing a number of health challenges.